Bowen Charlton "Sonny" Tufts III (July 16, 1911 – June 4, 1970) was an American stage, film and television actor and opera singer. After graduating from Yale in 1935, Tufts auditioned with the Metropolitan Opera in New York but eventually worked on the Broadway stage. He appeared in the stage show "Who's Who" and "Sing for Your Supper". Tufts then began singing in hotels and nightclubs. A Yale classmate of Tufts' later convinced him to move to Hollywood to begin a career as an actor. Upon arriving in Hollywood, Tufts' friend, hotel manager Jack Donnelly, accompanied Tufts to Paramount Pictures and introduced him to a casting director Joe Egli. Egli shot a screen test with Tufts who was then signed to Paramount. His first role was as Kansas, an affable Marine and love interest of Paulette Goddard in the 1943 World War II romantic drama "So Proudly We Hail!". The film was a critical and box office hit, largely due to the three female leads: Claudette Colbert, Paulette Goddard and Veronica Lake. Tufts' performance was praised by critics and the role served as a launching pad for Tufts' career. After the release of the film, Tufts received 1700 fan letters a week and was named "The Find of 1943." The following year, Tufts was cast opposite Olivia de Havilland in the comedy "Government Girl". That same year, he was voted the number one "Star of Tomorrow" by exhibitors. Before filming of "So Proudly We Hail!" was complete, director Mark Sandrich commissioned "So Proudly"'s screenwriter Allan Scott to write a vehicle for Tufts and his co-star Paulette Goddard. That film, entitled "I Love a Soldier", was released in 1945. During World War II, Tufts' popularity continued to rise principally because, due to an old college football injury, he was one of the few male actors not serving overseas in the war. By the early 1950s, Tufts' popularity began to wane and his career began to decline. In 1953, Tufts was cast opposite Barbara Payton in the low budget comedy film Run for the Hills. Later that year, he co-starred in another low budget film, "Cat-Women of the Moon". Tufts' career briefly rebounded when he was cast in a small role in the comedy "The Seven Year Itch", starring Tom Ewell and Marilyn Monroe. In 1956, Tufts had a supporting role in drama "Come Next Spring" for Republic Pictures. Tuft's career decline was compounded by his alcoholism and his off-screen antics. In February 1954, a 19-year-old dancer named Margarie Von accused Tufts of biting her on the right thigh while she was relaxing aboard a yacht docked off the coast of Balboa Peninsula, Newport Beach. Von sued Tuft for $26,000 claiming the bite left a three inch scar. Von later settled for $600. In March 1954, a stripper named Barbara Gray Atkins sued Tufts for $25,000 in damages after she claimed he bit her left thigh while he and two friends were visiting her home. Atkins later dropped the lawsuit against Tufts. After filming "The Parson and the Outlaw" in 1957, Tufts retreated to a ranch in Texas. 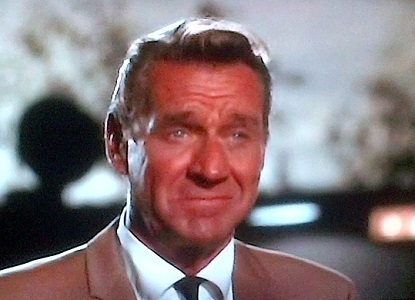 He returned to acting in 1963 with a guest appearance on 'The Virginian'. His final onscreen role was in the 1968 television movie "Land's End". 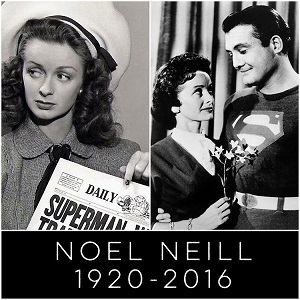 When it was announced last week that Noel Neill had passed away, I'm sure many thought immediately of her work as the first live-action Lois Lane. (She played the role in two 1940s movie serials, but she was the second Lois Lane on television.) I confess that's what I did as well, and I wrote about her years as Lois Lane from a Toobworld vantage point just yesterday. But the role of Lois Lane was not the only one she played on television. For our Video Sunday showcase, I have four episodes from other TV shows in which she appeared as one of the guest stars. I don't think it can be conjectured that any of these roles could be Lois Lane starting over in Life with a new name. (I might have been more inclined to do so if the shows were broadcast after the death of Superman/Clark Kent in 1964.) And there are familial connections with the two Western roles that would rule out the possibility that she was forced into starting new lives back in Time, either through the auspices of a Time Traveller like the Doctor, or because of an attack by the Weeping Angel of the Wild Wild West. So these four roles of Ms. Neill's can be enjoyed on their own without insulting her memory by forcing a connection to Lois Lane with any of them. My apologies on this next one. The person who shared it must have speeded up the soundtrack to give everybody chipmunk voices. I suppose they did so in order to avoid detection by whoever holds the copyright. "The Letter Of The Law"